What Kind of Roof Can I Have for My Patio? There are many different types of roof styles that you can choose from for your patio roof, a great option would be a Gable Patio Roof. A gable patio has two pitched sides that are joined in the middle and can be either be attached to your home or freestanding. The gable can be designed to match the pitch of your home or at the recommended 20%. A gable roofed patio is a perfect option for that feeling of open space and lends itself well for social occasions when you want to entertain, relax and enjoy your home. The pitch of the roof in a gable patio gives allows for the air to flow more freely, not trapping the heat. Having a more breezy feel, creates a lovely open space for you to enjoy and brings in that feeling of indoor / outdoor to your home. Design and style go hand in hand complimenting your home, the gable roof is always a great addition and can be matched to your existing colours or made in contrast for a more dramatic feel. Patios are a wonderful place to entertain. All year round your new patio can give you that open space which is a great addition to your home and the perfect place for the Christmas BBQ, family gatherings or a quiet cuppa with a friend. Having the extra coverage means you will be able to go outdoors anytime throughout the year and still enjoy the experience. Patios can provide shade in summer and a wonderful protected space in the winter. Your gable patio can be fitted with a panel or 2 of polycarbonate sheeting to allow in extra light in the winter. With the finishing touch of the infills to give that perfect level of protection. Why not go for a gable roof. If you are looking for more options or a combination of roof styles to make your new patio fit perfectly then CPR Outdoor Centre can help you with that too. Servicing Bunbury, Busselton and all nearby places CPR Outdoor Centre can give a free onsite quote and discuss the perfect options for your new patio. Contact CPR Outdoor Centre at one of our two locations 67 Halifax Drive, Bunbury 9726 2311 or 30 Barlee Street Busselton 9754 2657 for your free quote today. Why are my patio gutters overflowing? Wondering why your patio gutters are overflowing? Here are some answers to your questions; 5 reasons why gutters overflow. There are a wide variety of gutter materials, sizes, styles, and gauges which have their own benefits and drawbacks. But choosing the wrong one can be your nightmare. Make sure your gutters are Australian made to ensure they can last longer time perfect to save you money. Choose the most durable gutter you can afford. It is best to talk with your contractor or hardware store to know your roof size and width of the gutter that will fit your house. You also need to consider how many and where the downpipes are too so they can service your gutters. Blockage is the most common cause of overflowing. Regularly empty the gutters to prevent blockage mostly due to a build-up of leaves, seeds, dirt that fell from nearby trees or been blown in. During heavy rain the gutters will catch most of the downpour flowing from the roofs. Gutters overflow due to massive load of water that it just can’t get to the downpipes quick enough to cope with the massive amount of water all at once. Make sure you have downpipes with exact sizes to fit the gutters. Rainwater exits the gutter and falls to ground level by downpipe so it is required to have enough downpipes to prevent overflowing of rainwater from your gutters. Position your downpipes in the right place to be able to remove the water from your roof fast enough in a heavy shower of rain. Place your downpipes a few inches under the edge of the gutters to assure water will flow exactly down the pipes. CPR Outdoor Centre we are your patio people. We can manage your outdoor gutters, all your patio requirements and we will make it easy for you plus we are local! 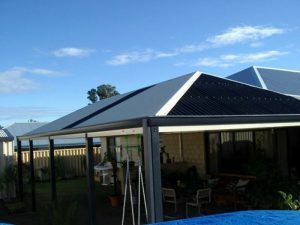 Contact CPR Outdoor Centre Bunbury (9726 2311) or CPR Outdoor Centre Busselton (9754 2657) for a FREE quote today and we can discuss your patio and gutter needs. We offer full installation services and DIY kits for patio, sheds, carports, and garages too. Looking for a patio in Dunsborough, Margaret River, Vasse, Capel or Busselton area? The best patios in the Busselton area come from CPR Outdoor Centre Busselton, we are your local patio builder. Whether you want to add a patio for entertainment purposes or just want to have that beautiful extension for extra space, you can have it the easy way. We, at CPR Outdoor Centre can custom build a patio to yourexact needs no matter how unique they are! We’ve got you covered from engineered designs for your new patio to planning down to getting building permits and approvals. We do it all, easy for you! CPR Outdoor Centre is for you! Why use CPR Outdoor Busselton for you patio in the Dunsborough, Margaret River, Vasse, Capel or Busselton area? 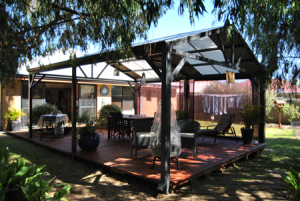 CPR Outdoor Centre is the best patio builder in Busselton and the surrounding areas. We are expert patio builders specialising in different patio design projects such as patio covers, verandahs, roofs, carports and many more. We also offer garage, sheds and poly rainwater installation. Apart from full installation services, we also offer DIY kits for our patios, garages, sheds and carports? Yes we do and if you are a DIY type of person, this is for you. Here at CPR Outdoor Centre, we only used materials with highest quality to deliver you the best results. We also pay close attention to details to ensure you are delighted with the outcome of your new patio. At CPR Outdoor Centre, we listen and then we can build your dream patio. If you are interested in talking your patio design with us, contact us now. CPR Outdoor Busselton are your local patio people in Dunsborough, Margaret River, Vasse, Capel, Busselton and surrounds. For patios Dunsborough, Patios Margaret River, patios Vasse, patios Capel call CPR Outdoor Centre on 9754 2657.